I'm not sure... it doesn't seem to have any maker's marks that would immediately distinguish it as European, like the concentric circles, or 's', 'p', or 'q' marks that appear on many of the Alexandrian XIIIb's. I just don't know enough about Mamluk/Middle-Eastern swords of the day to say whether it could be a local product or not. It looks like the pommel is of porphyry? If that is the case that must be quite unusual, or what? antico. You also had a popular green variety called porfido verde antico from the Peloponnese in Greece. This Alexandria Arsenal sword has a pommel that looks like a porphyry with a red-brownish matrix with predominately black phenocrysts (and one white ? or reflection?) - so to pinpoint the origin of the stone we need a specialist in porphyry and/or tiles as their number are legio. Thanks Roger! Great photos, hadn't seen them before. I think this is the one that was at the Park Lane Arms Fair in 2009? I'd be very interested if you have any other information on it to share. 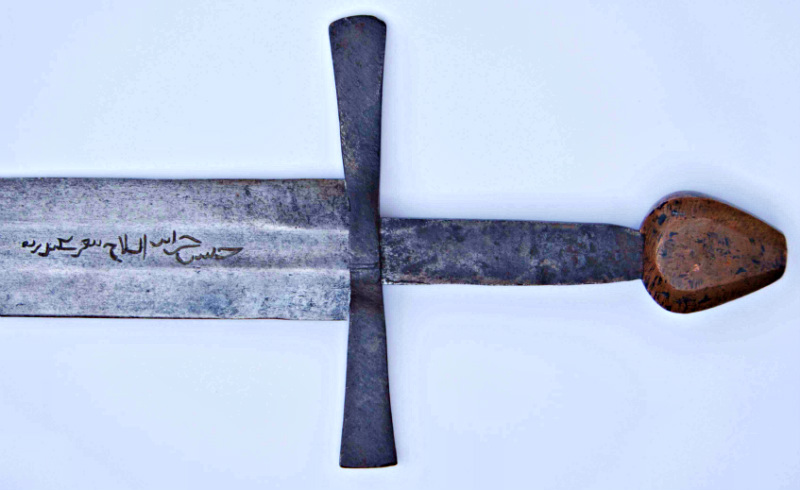 A few of these Syrian-Mamluk swords have European blades, although a large proportion of the number have blades that could be described as being of North African or Middle Eastern origin. The European ones tend to have distinctive maker's marks and one or two fullers, while the others have either multiple shallow fullers or none, with blades of a flattened lenticular section. Marks on the latter, when they occur at all, tend to be in the form of one to five dots, inlaid in a yellow metal that might be either gold or brass. The inscriptions of these pieces tend either to be from the bequest of the Sultan al-Ashraf Sha'ban (1368-69) or in the name of the Emir Yalbugha, whose bequest date is uncertain but probably between 1366 and 1391. One or two of the inscriptions may be from Aristay's time (1400-01) but this is far from certain. I suspect that the particular sword in question didn't sell because the buyers were not confident enough in either its provenance or appearance. This group seems to have spawned quite a number of questionable pieces, many of which have been offered at auction in recent years. Most are quite easy to spot, but some others are not so. The piece in question has a rather spurious inscription that is not engraved in the same manner as any genuine Alexandrian inscription, but seems to have been 'punched' with a number of special tools of a set radius. If I remember rightly, a whole bunch (10-15?) of these swords (with the same method of execution on their inscriptions) were offered mainly for private sale in around 2003. Most of them were of this distinctive Syrian-Mamluk style and most could be said to be quite good reproductions. They were rather let-down by their inscriptions though, and the fact that the non-metallic parts of the grip were all of an identical material (with a bit of colour variation). They were all in relatively good condition too, which is more than we can say for most of those that remain in Istanbul. 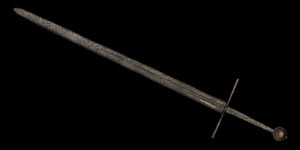 The Sotheby's sword above is undoubtedly from the same batch, to my mind. There were a few 'European' swords (c.4-5?) with 'Arabic' inscriptions from the group as well, but these were very crudely made. I haven't seen any of the latter since 2003, so they're probably hiding in someone's collection, somewhere. The pommels of this subgroup are all made from a solid copper alloy, with some seemingly containing more copper than others. None of them are made of any sort of stone, at least as far as I've seen. If this has been mentioned before in this thread, please forgive my redundancy. I remember reading somewhere (from you, Clive?) that these octagonal copper alloy pommels were probably not the original ones on these blades, but were later replacements, affixed either in Alexandria or Istanbul. The sword in Roger's photos is indeed the sword that was on display at the 2009 Park Lane Arms Fair, and one that I have been able to see and handle on numerous occasions (in fact, I think I originally took those photos!). It used to belong, many years ago, to Sir Richard Hyde Parker who owned four Alexandrian swords in total but these have all now been sold. The last one from his collection was sold at Christie's in 2010. 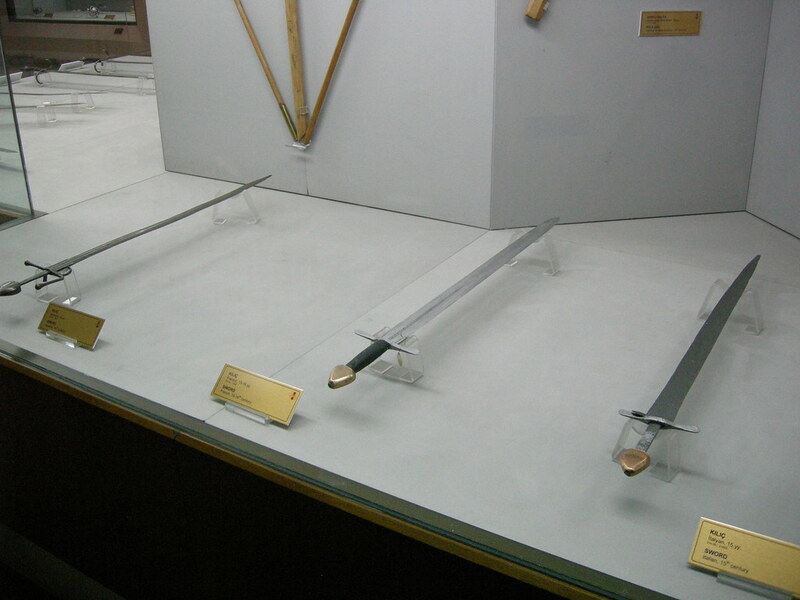 Thanks also for posting the photo of the swords in Istanbul. As you suggest, these are not the ones that I was referring-to earlier, but are numbered 11087 (middle) and 21653 (right). 11087 has an unidentified inscription that David Alexander dated (in his 1985 article) to 1400-01 but the 'handwriting' seems to me to be more consistent with the Sha'ban period (1360s, so another early example of Type XIX). 21653 may not even have an Arabic inscription, as one doesn't show up in any of the photos I have of the piece. There might be one on the underside but this is unlikely. As for the pommels themselves, I know of seven Alexandrian examples in total - three (including 21653) in the Military Museum in Istanbul; the two in Dean Castle, Kilmarnock; the ex-Hyde Parker sword above; and one that is only known from an old photograph taken c.1895-6 by F.R. Martin of the Livrustkammaren in Stockholm. The whereabouts of the last sword is currently unknown, but it will be easy to identify as it was missing several centimetres of its tip in the vintage photo. There is another broadly similar one in the Military Museum (No. 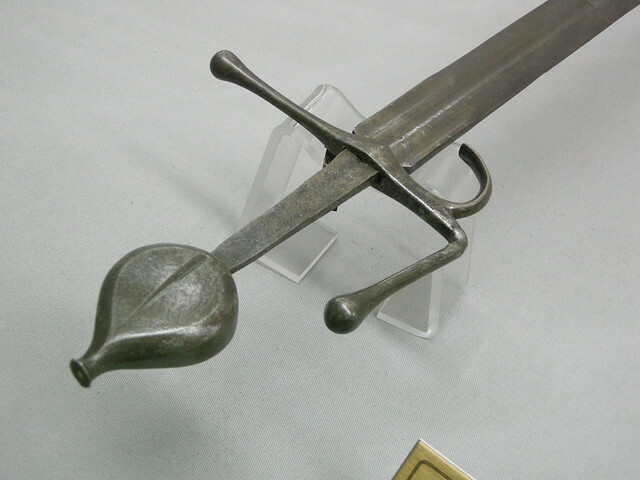 3986), on a Type XIX sword dated 1392, but with the top of the pommel drawn out into a sort of 'peak'. It differs also, however, from the main subgroup as the pommel in question is made of iron. There are a few examples of the pear-shaped type of pommel in 14th century art, including at least two of nearly similar form on tomb slabs in the Armenian Church in Nicosia, Cyprus (dated 1356 and 1385). The best representations, however, are those on the incised effigial slabs of Sir Lambieres d'Abée in Liège, Belgium (1312), and of Guillaume Tirel at Yvelines, near Paris (1363). Does this mean that these pommels have a Western European origin...? Perhaps, but we can't say for sure as they are too rare to be representative enough. It may be they were inspired by a pommel of Western origin and locally manufactured in Cyprus or, as Roger suggests, associated later by either the Mamluks or the Ottomans. The blades all seem to be Italian, either of Type XIIIb or XIX, with one exception (the above-mentioned 21653, which seemingly has a simple lenticular section with no fuller). Oakeshott does not show the pommels at all in any of his typologies, and nothing therein really comes close. Perhaps one indication of whether these pommels were originals or later additions is how well balanced these swords are. If they are later, and were added just for display, then they may not have cared about them being an appropriate weight for each individual blade. The three swords of this group that I've been able to handle directly (i.e. the XIX and XIIIb in Dean Castle, plus the ex-Hyde Parker XIIIb sword) are all balanced as you would expect for swords that were primarily intended for dealing dismembering, shearing blows. The Hyde Parker sword is the largest and heaviest of the group (3 lb 1/2 oz in weight compared with 2 lb 9 oz and 2 lb 7 oz respectively for the Dean Castle swords), and has more perceived weight in the blade when held, but this is not excessive. The handling characteristics of these swords are very similar to the better-known Alexandrian XIIIb types with circular pommels and inscriptions dated 1367-68. Of course, this still doesn't answer our question of the origin of the pommels but my feeling is that they were carefully matched to the swords. Hi Clive, thanks again for sharing your expertise. I had my doubts about the inscription even when I first posted it, so it's a bit of a relief to hear you say this. It's discouraging the the large auction houses don't seem to hesitate to offer these dubious pieces at inflated prices... doing so for high-profile items with a body of literature already available for comparison seems like a lack of due diligence to me. There were a few 'European' swords (c.4-5?) with 'Arabic' inscriptions from the group as well, but these were very crudely made. I haven't seen any of the latter since 2003, so they're probably hiding in someone's collection, somewhere. It used to belong, many years ago, to Sir Richard Hyde Parker who owned four Alexandrian swords in total but these have all now been sold. The last one from his collection was sold at Christie's in 2010. I'd heard of this collection via the 2010 sale, and know a second sword was also exhibited in 1963 - I only have the written description, but am guessing it's one of the 'classic' XIIIb's with disc pommels... Can I ask what do you know about the fourth sword from Hyde Parker's collection? As you suggest, these are not the ones that I was referring-to earlier, but are numbered 11087 (middle) and 21653 (right). Would this resemble no. 11597, partly visible at far left in the first photo I posted? I don't believe this latter example is Alexandrian, and probably from a later date... I know of a couple depictions of this pommel form in Spanish art between 1450-1500. So the "porphyry look" was just me having an optical illusion. So you have a pitting of black patina in the pommel. That is in itself fairly unusual, since you would expect green patina on copper that has been exposed to the air for several hundreds of years. 1) So since this is apparently a copper alloy of some kind (and not pure copper), then the black patina can be created (intentionally or by chance) if the copper contains a few % of gold which creates small surface crystals of cuprite, that are black (small changed in the otherwise red cuprite crystal lattice). In antiquity Corinthian bronzes were famous for their black patina and it was also used in Egypt, where the type had the specific name "hsmn-km". In Japan it was called "Shakudo" and in older times contained 1-3% gold. 2) Otherwise the pommel could have been cleaned of its original patina at some point and then afterwards been exposed to humid air with only traces of sulphur dioxide (a museum !) which can create a black patina. I'm wondering has any thermoluminescence dating been done on any of the Alexandrian Arsenal (or other) swords to spot a fake or not? I know it is used often with pottery, but I wonder whether it can be used at all on sword blades since the surface of old swords will have undergone chemical alteration (rust), that might seriously interfere with the dating? Problem is also the loss of material for the process and probably no one wants to drill into a sword to find a 100 mg "fresh" sample. I'll withhold judgement on this one for the moment, as I know its current whereabouts and will try to have a closer look at it sometime soon. As it appears to be in 'excavated' condition, I'm guessing that it did not come from Istanbul anytime recently, as almost all European Arabic-inscribed swords (and quite a few others) are generally in 'armoury preservation' condition. The inscription is certainly unusual both for its content and for the fact that it has been inlaid. Cat. No. 64: This is the large, broad-bladed, Aristay-inscribed Type XIII that sold at Christie's (13th April 2010, Lot 60) for nearly £400k. Sir Richard still had it when I went to see him in 2006, and I still consider myself very lucky indeed to have spent an afternoon with it! Unfortunately, I only had a fairly low-end film camera back then and the photos that I was able to take were not the best. I've no idea who bought it in 2010. 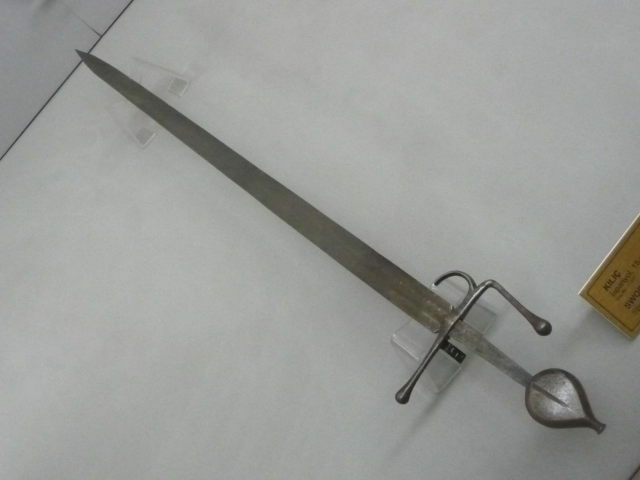 Total length: 104.2cm; Blade length: 87.3cm; Width of blade: 3.2cm; Width of quillons: 15.0cm; Diameter of pommel: 5.2cm. The European inscription on the blade appears to consist of the letters 'N R L' (although these are difficult to read) and the blade is also struck with the mark of what appears to be a crowned heart. Here is another photo of it (with thanks to Neil Melville for this). Otherwise the pommel could have been cleaned of its original patina at some point and then afterwards been exposed to humid air with only traces of sulphur dioxide (a museum !) which can create a black patina. That is a fairly likely explanation, I think. It's interesting that this one's pommel is quite 'dull' in appearance, as is that of the XIIIb in Dean Castle (Inv. No. S.85). The other one at Dean, the Type XIX (S.86), has a bright surface just like those in Istanbul, as can be seen in the photos 'up-thread'. I'll be willing to bet that all four of the Hyde Parker swords were once part of the inventory of Hal Furmage, the London dealer who introduced a large number of these pieces onto the market around 1930. Sir Richard Hyde Parker inherited them from his father, who may in turn have purchased them from Air Marshal Sir Ralph Sorley around 1953. So they have all been quite well looked after in private collections since at least the early 1950s. I don't know in what conditions Furmage kept his stock, but apparently there are some photos that exist of his premises at the time he had the swords. Naturally, I will be trying to locate these! I'm wondering has any thermoluminescence dating been done on any of the Alexandria Arsenal (or other) swords to spot a fake or not? Not to my knowledge. One or two have been submitted to X-rays but that is about it as far as I know. This is a bit of a shame, really, considering the large amount of fakes that are currently out there and the potential prices that can change hands for these pieces. Thanks Clive for the information on 11597. I am sorely tempted to have somebody recreate that sword. So the difference in dullness or shininess could be that some was polished more recently than others and also that variations in the humidity surrounding the sword. Patination colour changes of copper is apparently a very tricky business as factors such as impurities of other metals, air composision and humidity plays a big role. Given enough time copper should end up green normally, so when that is not the case in ~600 years old sword it beckons an explanation. Here is a site where you can chemically create different patination colourings on copper, bronze and brass. "Copper goes through a natural oxidation process that forms a unique protective patina on the metal. The surface of the metal undergoes a series of color changes: from iridescent/salmon pinks to oranges and reds interspersed with brassy yellows, blues, greens and purples. As the oxide thickens, these colors are replaced by russet and chocolate browns, dull slate grays or blacks, and finally to a light-green or blue-green." "Copper’s patination process is complex. It starts immediately on exposure to the environment with the initial formation of copper oxide conversion films that are noticeable within six months. Weathering may be uneven at first but the film becomes even after about nine months. Within the first few years, cuprous and cupric sulfide conversion films darken the surface to browns and then dull slate gray or dull black. Continued weathering transforms the sulfide films to sulfates, which are the notable blue-green or gray-green patinas." "The rate of patination conversion is dependent upon copper’s exposure to moisture, salt, and acidity from acid-forming pollutants. In marine climates, the entire patination process can take seven to nine years. In industrial environments, patina formation reaches its final stage in about fifteen to twenty-five years. In clean rural atmospheres with low concentrations of airborne sulfur dioxide, the final stage may take ten to thirty years to develop. In arid environments, a patina may not form at all if the moisture is insufficient. Where patination does take place in arid environments, it may mature to an ebony or nut brown. In all environments except the coastal areas, patination takes longer for vertical surfaces due to more rapid water runoff." The last is interesting - that in arid conditions patination might be ebony-black or not-brown and not reach the typical green endstate we are used to in Europe [Copenhagen have tons of green copper roofs, but also definitely do not have arid conditions]. I would still think it could be possible to make a drill sample in the tang for instance - so you wont damage the blade itself, but of course paying for the research lab and then risk ending up with a proven fake worth nothing is not something a seller normally wants to do. [It should be fairly easy to discern whether the tang is original to the blade or welded to the blade in the case of a "fake composite"].